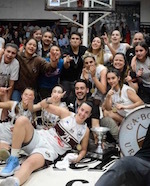 Bohemios celebrate Division Oro title defeating Malvin 71:62 in the decisive third game. Bohemios posted a 19-13 lead at the start and added a 17-11 rally in the second frame. Moreover they notched a 17-16 run in the third period and did not mind an 18-22 loss at the end of the game. FLORENCIA Castelao top-scored for the winners with 23 points and Camila Suarez (178-SG-00) nailed 20. Fernanda Midaglia (173-G-96, college: Florida Atlantic) followed them with 9 points in the winning effort. Florencia Somma (175-PF-88) replied with 17 points and 10 rebounds in a loss, whilst Florencia Fernandez (98) had 15. Bohemios tied the Final series as they demolished Malvin 88-63 in the second game of the Finals. Bohemios took a 19-11 early lead and had a 3-point advantage at the halftime. In the third period, Bohemios scored 32 points and finished the game with a massive 22-13 surge. JOSEFINA RODA top-scored for the winners with 21 points and Fernanda Midaglia (173-G-96, college: Florida Atlantic) nailed 17. FLORENCIA CASTELAO scored 16 whilst Karina Acosta (F) poured in 15. Monnazjea Finney-Smith (185-G/F, college: Hampton) ended up with 19 points in the losing effort, whilst Florencia Fernandez (98) notched 11. 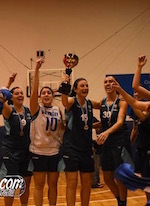 Malvin have won Finals opener against Bohemios 70-65. The latter looked better in the start of the game and won both two periods for a 4-point lead at the halftime. Malvin replied with an 18-15 run in the third quarter and then won the game due to 21-15 surge at the end. Florencia Somma (175-PF-88) top-scored for the winners with 18 points and Monnazjea Finney-Smith (185-G/F, college: Hampton) netted 14. Camila Suarez (178-SG-00) replied with 13 in a loss, whilst Rossana Dagnino (172-G-89) poured in 12.